Herbivory is poorly characterized in the endangered California sage scrub ecosystem, because previous studies were conducted only in winter and spring. To better understand vertebrate herbivore impacts, we first examined if and when vertebrate herbivores influence Artemisia californica seedling survivorship by examining differences in mortality between caged and uncaged seedlings. 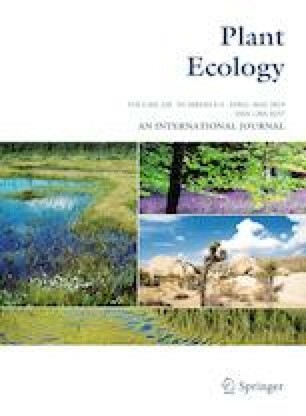 Then, we examined: (1) vertebrate herbivore preference of common sage scrub shrub species, and (2) which vertebrate species constitute important herbivores in the ecosystem. We found that mortality for uncaged A. californica seedlings was twice that of caged seedlings, and occurred in the summer and early fall, when previous studies in the system were not conducted. Short leaved shrubs, Artemisia californica and Eriogonum fasciculatum, were more susceptible to herbivory than broader leaved Salvia apiana and Eriodictyon trichocalyx. However, susceptibility likely depends on the herbivore assemblage, as the three main herbivore species [Sylvilagus audubonii (desert cottontail), Zonotrichia leucophrys (white-crowned sparrow; a bird, not a mammal), and Otospermophilus beecheyi (California gray squirrel)] all had different shrub preferences. Our results contrast with previous studies that suggests that native vertebrate herbivores facilitate shrub seedling survivorship by highlighting that late-season vertebrate herbivory may negatively affect shrub seedling survivorship. We demonstrate the complex but understudied role herbivores play in the sage scrub ecosystem, and highlight that further study of these key ecological interactions is warranted. Communicated by Devan Allen McGranahan. We thank the Pomona College Biology Department and the Henry David Thoreau Foundation for funding.